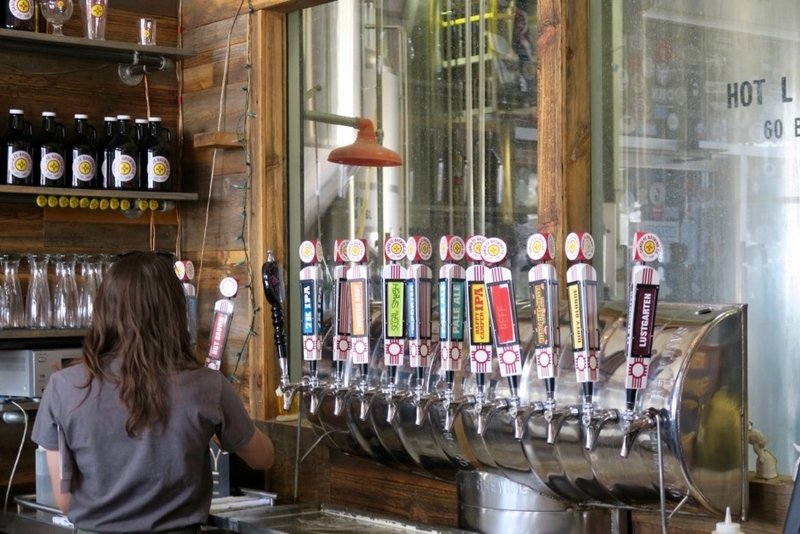 Santa Fe Brewing has three locations in Santa Fe. I couldn’t find a lot of information about their newest spot and since there was a chance it would be a long time before returning we decided to visit their original location and current production facility. Truth be told, I hadn’t seen a lot of photos of that either and I was surprised upon entry to find that it was a relatively small taproom. 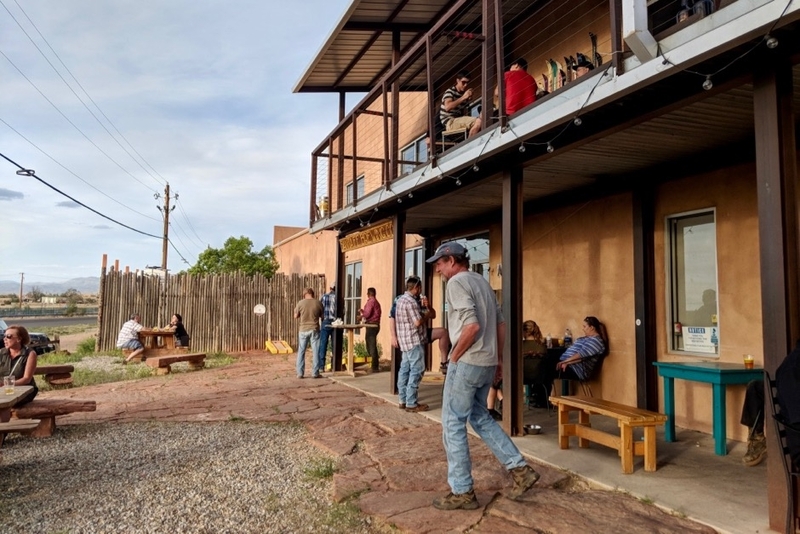 For the oldest brewery in New Mexico and one I’d seen on most tap lists during our visit I expected a little more than just a small bar with a handful of seats. We were planning on seven people and an infant. Luckily, we found two tables upstairs that we could push together. 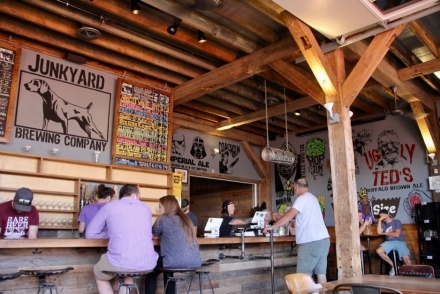 The taproom is divided into four distinct areas. There is the main bar area which is a small room downstairs. Then there is an upper area that has a few tables and some parlor games, a balcony, and a patio out front. We could’ve fit outside at a picnic table but they were completely full when we arrived. After securing a table for our group I was sent downstairs to order my beer. While waiting in a short line in the crowded downstairs area I took a look at my surroundings. 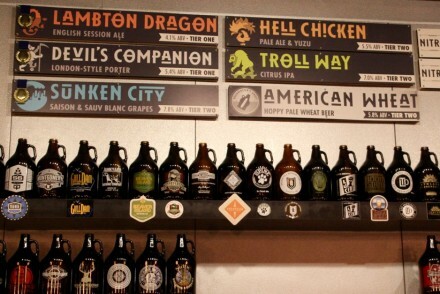 Like most older breweries it was clear that this taproom was an afterthought. The carpet was worn, the patio was more like someone’s front yard, and there was a tiny window looking into a corner of their facility. What they lacked in polish they made up with character. 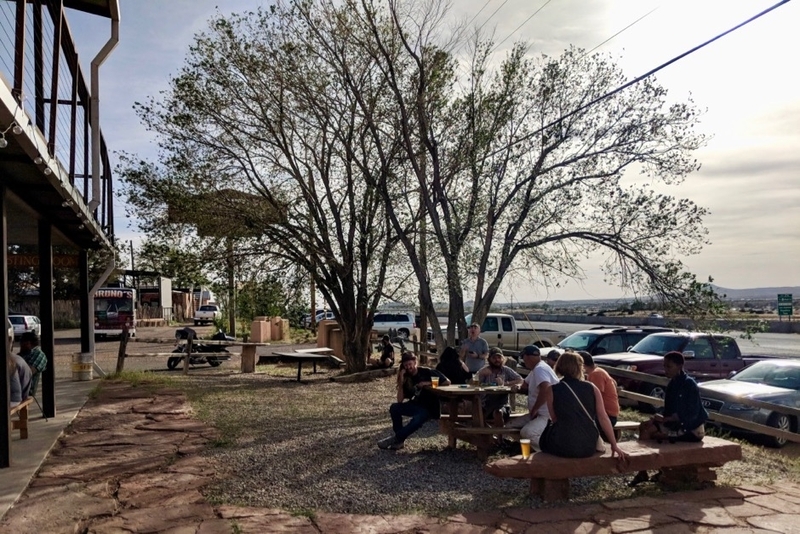 It was packed with regulars, not a single tap handle was screwed on the same direction, and the patio had a relaxed energy. I returned upstairs to find that the rest of our group had arrived. I’d ordered myself a Nut Brown Ale. 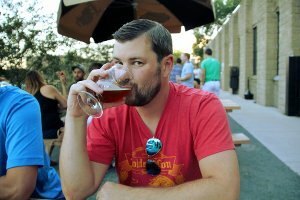 It was an easy drinking ale packed with roasted malt flavors and a hint of nuttiness. My second beer was Lustgarten, a dark lager brewed with raspberries. Too sweet for my taste, with a raspberry flavor that overpowered the rest of the beer. The last drink I ordered was their standard Pale Ale. It’s one of their flagship beers and I can see why. The maltiness made the beer full bodied while there was just enough hops to balance things out. Effortlessly drinkable! 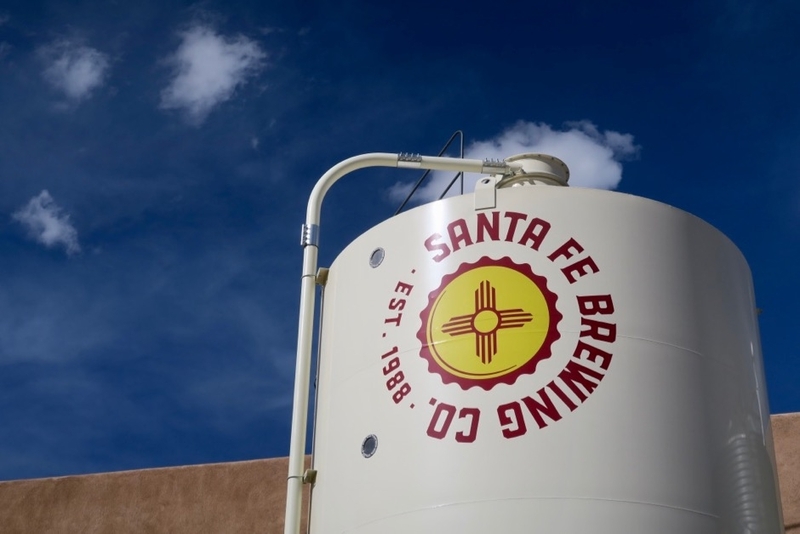 Santa Fe Brewing Company is one of the most iconic breweries I’ve ever seen. This is aided in large part by their logo which features a red sun symbol of the Zia on a field of yellow which is made famous by the Flag of New Mexico. Their can design consists of their logo on a mono-color backdrop. It results in cans that pop right off the shelf and look good in anyone’s hand! I would drink many during our nights at the rental. 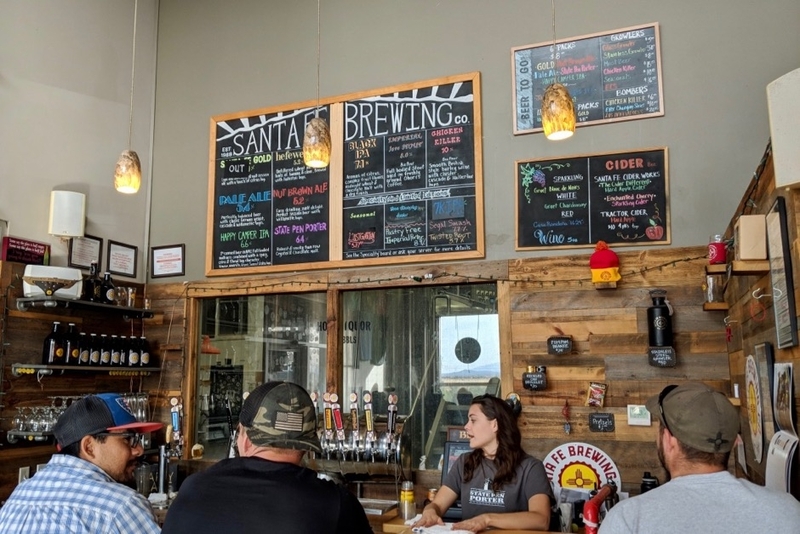 I was honestly a little underwhelmed by the Santa Fe Brewing Company taproom. For the oldest brewery in the state and one that is so pervasive and iconic I figured it would be more of a destination. If I had to do it all over again I’d take a chance on one of their other locations in Santa Fe. 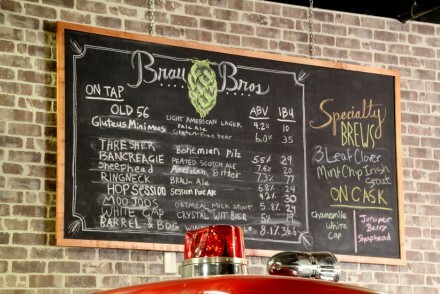 The Brakeroom is their newest spot that looks like an intimate bar, and the El Dorado Taphouse looks to be closer to what I’d expect from a craft brewery. That’s not to say I was disappointed in the visit. The beer was good, but the experience could’ve been so much more.